The Ilokano people had their own distinct indigenous writing system and script known as kur-itan. There have been proposals to revive the kur-itan script by teaching it in Ilokano-majority public and private schools in Ilocos Norte and Ilocos Sur. A lingua franca of the northern region of the Philippines, it is spoken as a secondary language by more than two million people who are native speakers of Ibanag, Ivatan, and other languages in Northern Luzon. 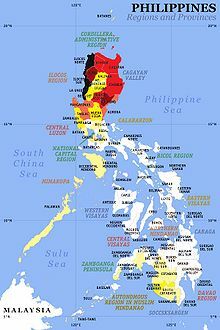 The language is spoken in northwest Luzon, the Babuyan Islands, Cordillera Administrative Region, Cagayan Valley, parts of Central Luzon, Mindoro and scattered areas in Mindanao. The language is also spoken in the United States, with Hawaii and California having the largest number of speakers. It is the third most spoken non-English language in Hawaii after Tagalog and Japanese, with 17% of those speaking languages other than English at home (25.4% of the population) speaking the language. In September 2012, the province of La Union passed an ordinance recognizing Ilocano (Iloko) as an official provincial language, alongside Filipino and English, as national and official languages of the Philippines, respectively. It is the first province in the Philippines to pass an ordinance protecting and revitalizing a native language, although there are also other languages spoken in the province of La Union, including Pangasinan and Kankanaey. Our Father prayer from Doctrina Cristiana, 1621. Written in Ilocano using Baybayin script. In recent times, there have been two systems in use: The "Spanish" system and the "Tagalog" system. In the Spanish system words of Spanish origin kept their spellings. Native words, on the other hand, conformed to the Spanish rules of spelling. Most older generation of Ilocanos use the Spanish system. In the system based on that of Tagalog there is more of a phoneme-to-letter correspondence, and better reflects the actual pronunciation of the word. [a] The letters ng constitute a digraph and counts as a single letter, following n in alphabetization. As a result, numo humility appears before ngalngal to chew in newer dictionaries. Words of foreign origin, most notably those from Spanish, need to be changed in spelling to better reflect Ilocano phonology. Words of English origin may or may not conform to this orthography. A prime example using this system is the weekly magazine Bannawag. Itedmo kadakami iti taraonmi iti inaldaw. In 2009, the Philippine Department of Education instituted department order 74, s. 2009 stipulating that "mother tongue-based multilingual education" would be implemented. In 2012, department order 16, s. 2012 stipulated that the mother tongue-based multilingual system was to be implemented for kindergarten to grade 3 effective school year 2012-2013. Ilocano is used in public schools mostly in the Ilocos region and the Cordilleras. It is the primary medium of instruction from kindergarten to grade 3 (except for the Filipino and English subjects) and is also a separate subject from grade 1 to grade 3. Thereafter, English and Filipino are introduced as mediums of instructions. The ten commandments in Ilocano. Ilocano animistic past offers a rich background in folklore, mythology and superstition (see Religion in the Philippines). There are many stories of good and malevolent spirits and beings. Its creation mythology centers on the giants Aran and her husband Angalo, and Namarsua (the Creator). Ilocano culture revolves around life rituals, festivities and oral history. These were celebrated in songs (kankanta), dances (salsala), poems (dandaniw), riddles (burburtia), proverbs (pagsasao), literary verbal jousts called bucanegan (named after the writer Pedro Bucaneg, and is the equivalent of the Balagtasan of the Tagalogs) and epic stories. Unstressed /i/ and /u/ are pronounced [ɪ] and [ʊ] except in final syllables, like pintás (beauty) [pɪn.ˈtas] and buténg (fear) [bʊ.ˈtɛŋ] but bangir (other side) and parabur (grace) are pronounced [ˈba.ŋiɾ] and [pɐ.ˈɾa.buɾ]. Diphthongs are combination of a vowel and /i/ or /u/. In the orthography, the secondary vowels (underlying /i/ or /u/) are written with their corresponding glide, y or w, respectively. Of all the possible combinations, only /aj/ or /ej/, /iw/, /aw/ and /uj/ occur. In the orthography, vowels in sequence such as uo and ai, do not coalesce into a diphthong, rather, they are pronounced with an intervening glottal stop, for example, buok hair /bʊ.ʔuk/ and dait sew /da.ʔit/. /oi/, /ui/[c] oy, uy baboy "pig"
Ilokano is one of the Philippine languages which is excluded from [ɾ]-[d] allophony, as /r/ in many cases is derived from a Proto-Austonesian *R, compare bago (Tagalog) and baró (Ilokano) new. The language marginally has a trill [r] which was spelled as "rr", for example, serrek [sɛ.ˈrɛk] to enter. Trill [r] is sometimes an allophone of [ɾ] in word-initial position and word-final positions, spelled as single <r>. But it is different in proper names of foreign origin, mostly Spanish, like Serrano, which is correctly pronounced [sɛ.ˈrano]. Some speakers, however, pronounce Serrano as [sɛ.ˈɾano]. The placement of primary stress is lexical in Ilocano. This results in minimal pairs such as /ˈkaː.yo/ (wood) and /ka.ˈyo/ (you (plural or polite)) or /ˈkiː.ta/ (class, type, kind) and /ki.ˈta/ (see). In written Ilokano the reader must rely on context, thus ⟨kayo⟩ and ⟨kita⟩. Primary stress can fall only on either the penult or the ultima of the root, as seen in the previous examples. Vowel length coincides with stressed syllables (primary or secondary) and only on open syllables except for ultimas, for example, /'ka:.yo/ tree versus /ka. 'yo/ (second person plural ergative pronoun). As primary stress can fall only on the penult or the ultima, suffixation causes a shift in stress one syllable to the right. The vowel of open penults that result lengthen as a consequence. ^ However, there are notable exceptions. The reverse is true for the vowel /u/ where it has two representations in native words. The vowel /u/ is written o when it appears in the last syllable of the word or of the root, for example kitaemonto /ki.ta.e.mun.tu/. In addition, e represents two vowels in the southern dialect: [ɛ] and . ^ The diphthong /ei/ is a variant of /ai/. ^ The distinction between /o/ and /u/ is minimal. ^ the symbol '∅' represents zero or an absence of a phoneme. ^ Ilocano syllables always begin with a consonant onset. Words that begin with a vowel actually begin with a glottal stop ('[ʔ]'), but it is not shown in the orthography. When the glottal stop occurs within a word there are two ways it is represented. When two vowels are juxtaposed, except certain vowel combinations beginning with /i/ or /u/ which in fact imply a glide /j/ or /w/, the glottal stop is implied. Examples: buok hair [buː.ʔok], dait sew [daː.ʔit], but not ruar outside [ɾwaɾ]. However, if the previous syllable is closed (ends in a consonant) and the following syllable begins with a glottal stop, a hyphen is used to represent it, for example lab-ay bland [lab.ʔai]. ^ a b c d e f g Letters in parentheses are orthographic conventions that are used. ^ Spanish permits stress to fall on the antepenult. As a result, Ilokano will shift the stress to fall on the penult. For example, árabe an Arab becomes arábo in Ilocano. ^ a b c Galvez Rubino, Carl Ralph (2000). Ilocano Dictionary and Grammar: Ilocano-English, English-Ilocano. University of Hawai'i Press. ISBN 0-8248-2088-6. ^ a b c Elias, Jun (19 September 2012). "Iloko La Union's official language". Philippine Star. Retrieved 24 September 2012. ^ Hammarström, Harald; Forkel, Robert; Haspelmath, Martin, eds. (2017). "Iloko". Glottolog 3.0. Jena, Germany: Max Planck Institute for the Science of Human History. ^ Ethnologue. "Language Map of Northern Philippines". ethnologue.com. Ethnologue. Retrieved 7 December 2015. ^ Bellwood, Peter (1998). "Taiwan and the Prehistory of the Austronesians-speaking Peoples". Review of Archaeology 18: 39–48. ^ Diamond, Jared M. (2000). "Taiwan's gift to the world." Nature 403 (6771): 709–10. doi:10.1038/35001685. PMID 10693781. ^ Lewis, M. Paul; Simmons, Gary F; Fennig, Charles D. "Ethnologue: Languages of the World, Eighteenth edition". SIL International. Retrieved 17 December 2015. ^ Rubino, Carl (2005). "Chapter Eleven: Iloko". In Adelaar, Alexander (ed.). The Austronesian Language of Asia and Madagascar. Himmelmann, Nikolaus P. Routledge. p. 326. ISBN 0-7007-1286-0. ^ Detailed Languages Spoken at Home in the State of Hawaii (PDF). Hawaii: Department of Business, Economic Development & Tourism. March 2016. Retrieved 19 March 2018. ^ Komisyon sa Wikang Filipino (2012). Tarabay iti Ortograpia ti Pagsasao nga Ilokano. Komisyon sa Wikang Filipino. p. 25. ^ Panfilio D. Catacataca (30 April 2015). "The Commission on the Filipino Language". ncca.gov.ph. National Commission for Culture and the Arts. Retrieved 7 December 2015. ^ Dumlao, Artemio (16 May 2012). "K+12 to use 12 mother tongues". philstar.com. Retrieved 4 September 2018. ^ Vanoverbergh, Morice (1955). Iloco Grammar Catholic School Press/Congregation of the Sacred Heart of Mary, Baguio City, Philippines. 348pp. ^ Gelade, George P. (1993). Ilokano English Dictionary. CICM Missionaries/Progressive Printing Palace, Quezon City, Philippines. 719pp. ^ Vanoverbergh, Morice (1956). Iloko-English Dictionary:Rev. Andres Carro's Vocabulario Iloco-Español. Catholic School Press, Congregation of the Immaculate Heart of Mary, Baguio City, Philippines. 370pp. ^ Vanoverbergh, Morice (1968). English-Iloko Thesaurus. Catholic School Press, Congregation of the Immaculate Heart of Mary, Baguio City, Philippines. 365pp.